Waterstones Bradford Wool Exchange01274 723127work Shop - BookA gem of a bookshop, housed in Bradford's Victorian Gothic Wool Exchange building. We offer a wide choice of titles, great value and expert advice from a dedicated and passionate team of booksellers. You will also find a wide range of stationery, greetings cards, gifts, games and toys. On the mezzanine floor you can sit in our Café W, with a coffee, cake and book and admire the architecture of both the shop and the city. We are proud to be at the heart of Bradford and Bradford will always be in our hearts! 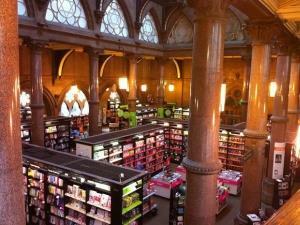 A gem of a bookshop, housed in Bradford's Victorian Gothic Wool Exchange building.